On October 31 2017, exactly 500 years after Maarten Luther posted his 95 theses and 300 years after the former organ was rebuilt, the reconstructed baroque organ, built by Bernhardt Edskes, was inaugurated during the opening concert of the Schnitger Festival 2017. Directed by Ton Koopman, the Lutheran Bach Ensemble and organists Tymen Jan Bronda and Robert Koolstra excelled in a program with the cantata 'Ein feste Burg' (BWV 80) by Johann Sebastian Bach, a concerto by Joseph Haydn and more. In the following days the organ could be heard in multiple recitals, both solo and accompanying other instruments. The recitals drew considerable crowds and received much enthusiasm. The board of the foundation is very satisfied that all of our efforts sofar have led to this beautiful result. The new baroque organ (click to enlarge). In 1699 the famous organ builder Arp Schnitger of Hamburg, Germany, bestowed an organ upon 'his' Lutheran congregation in Groningen1. The instrument had two manual keyboards (great and positive). In 1717 the organ was extended with a free pedal - according to a plan prepared by Schnitger - to cater for the growth of the congregation. The work was carried out by Schnitger's local assistents Jannes Radeker and Rudolf Garrels. This instrument has sadly been decommissioned by the organ building firm of Petrus van Oeckelen and sons when they installed a new organ around 1896. In 2001 special cantata services were reintroduced in the Lutheran Church of Groningen. As a result the Lutheran Bach Ensemble was founded in 2006. It aims to perform (Bach-)cantatas as faithfully as possible according to the historic traditions. The new baroque organ is extremely well suited for this purpose with its separate continuo keyboard that allows playing the organ from the position of choirmaster(-organist). The reference point for the project was the situation of 1717, for practical purposes however with a Praestant 8' instead of a Praestant 4' as the 'sound foundation' of the organ. Archival research revealed the measurements and compass of the former instrument and also the surprisingly low pitch (the so-called 'Kammerton', stipulated in the contract with Garrels and Radeker). This pitch makes the organ ideal for accompanying baroque instruments. The original stop list was already well-known from a number of sources. Based on the dimensions and type (Hauptwerk - Brustwerk - Pedal) of the former organ, the Schnitger-organ of Pellworm was selected to provide a design for the facade. The assembly of the organ and its complete voicing were performed in the church between the end of april and the third week of October 2017. During this period a few modifications and enhancements were made to the original plans. 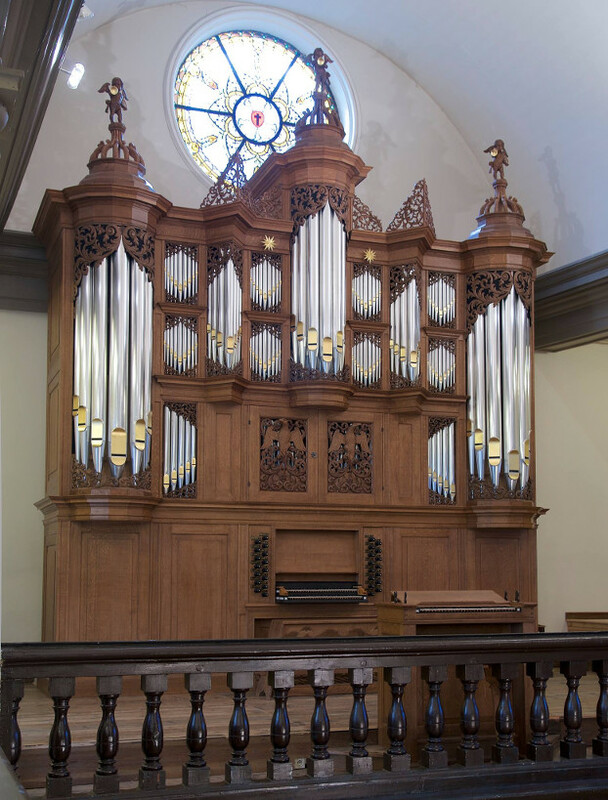 The organ builder donated an extra stop, the Praestant 4' of the Brustwerk, financed from the estate of his brother, the late famous organ expert Cornelius H. Edskes. This stop enables a wealth of new registration possibilities and makes the Brustwerk plenum a worthy alternate of the Manual plenum. Furthermore, it was decided to exchange the planned Vox Humana 8' of the Manual for a Fagot 16'. This was done for a number of reasons. In the first place, the organ already posseses an eight foot solo reed with the Dulcian 8' of the Brustwerk. Of course the Fagot 16' could also be used in that way, played an octave higher. Also the Vox Humana would be located at the back of the case close to some big ventilation holes in the wall. This would be less favourable for keeping this reed with its short resonators in tune. On the other hand, the Fagot 16' provides a lot of extras. It is a beautiful addition to the Manual plenum, lending it a 16-foot basis and extra sonority. It is also extremely valuable in the basso-continuo accompaniment for which the organ will be used a lot. A Fagot (or Dulcian) 16' fits very well in the sound concept of Arp Schnitger and he regularly built it in organs of comparable size (e.g. the neighbouring Pelstergastkerk organ from which the Fagot 16' served as a model, Cappel, Lüdingworth). The Siffluit 4' of the Manual that is listed in old disposition records was not built. As far as we currently know, Schnitger never built a stop like this. It is plausible that the old record are erroneous at this point and it really was a Spitsfluit 4'. This stop was very common in a Schnitger-organ of this size (the organ on Pellworm also has it) and was therefore built here as well. With regard to the composition of the mixtures, it was decided after extensive accoustic testing to let the Mixture of the Manual have 5 to 6 ranks, that of the Pedal 5 ranks and the Scharp of the Brustwerk 4 ranks. At the very last moment it was decided to add a Cymbelstern, again similar to the organ on Pellworm. One of the restored angels. tremulant, cymbelstern, sliding coupler, pitch a1 = 415 Hz. The organ case is constructed from massive quarter-sawn oak and decorated with traditional wood carvings in the style of Jan de Rijk. This beautifully fits with the church interior (pulpit by Jan de Rijk). 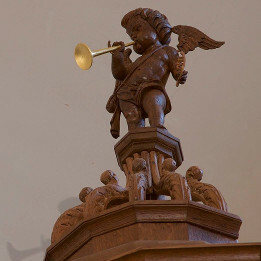 Two statues of trumpet-playing angels very likely carved by (the workshop of) Jan de Rijk were acquired, restored and placed on top of the organ. They are accomponied by a little brother that is a copy of one them. The carved doors of the Brustwerk are a smaller size copy of the Brustwerk doors of the Schnitger-organ in the Der-Aa church. They contain two eagles that also appear in the coat of arms of the city of Groningen. The case and carvings were treated with a substance cooked from oak chips that when applied mimicks/accelerates the natural darkening effect that oak acquires when it ages. Subsequently a layer of transparent bee wax was applied. The lips of all facade pipes, the cymbelstern and the trumpets of the angels were gilded with 23.75 carat gold leaf. The lower keys of the organ were covered with bone and the upper keys were made from ebony. The coupler volute was carved from boxwood. The stop names were handpainted in gold on shields from solid ebony with a hand-carved moulding at the edges. Despite that the organ is now fully functional we can not cease our fundraising activities yet. The organ builder has graciously extended the period in which we must make the final payment. Your financial support is therefore still crucial to us. There are several ways in which you can support us. It is possible to adopt individual pipes of the organ, here are still ample pipes left. In our shop various items can be bought, a beautifull CD by Wolfgang Zerer, a book on the (history of) the organ by Victor Timmer and delicious Schnitger wine. Also, it is possible to play the organ for a small fee. Up-to-date information with regard to the remaining deficit can be found here . If we manage to eliminate it, it will be possible to enrich the organ with large carvings on both sides!